Crowe visited Uttoxeter on 18 and 19 November 1868, and sketched a little in the market place, but was dismayed to find that it had changed so much since Johnson’s day. He was advised to visit a Mr Redfern, a cooper and local antiquarian, who was able to furnish him with much useful information about the contemporary look and layout of the market place. Further research was done at the British Museum. The painting, which is as least two metres in length, is now part of the collection of the Dr Johnson’s House Museum, and hangs in the garret room used by Dr Johnson to compile his Dictionary. 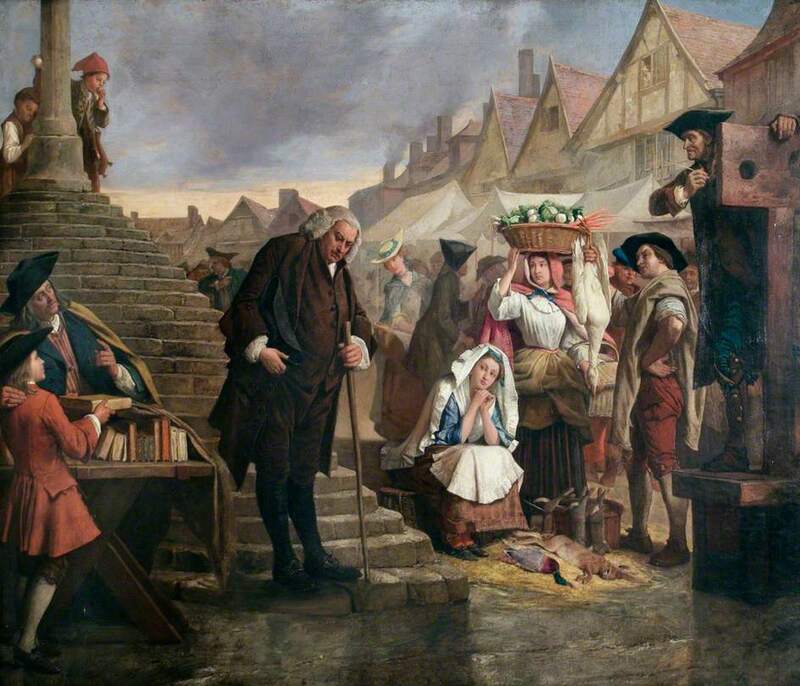 The title used by the museum is ‘Johnson (1709–1784), Doing Penance in the Market Place of Uttoxeter, Staffordshire’. Postcards and slides of the work are available from the Museum, and it is featured on the BBC – Your Paintings website. The Penance of Dr. Johnson (768) by Mr. E. Crowe, shows with perfect clearness the subject the artist has chosen … There is much sound work and capital rendering of expression here. The picture is a little hard and opaque. Mr. Eyre Crowe is a contrast to the last-named painter [Mr. A. Johnston] in earnestness, thoughtfulness, and careful fidelity to nature; he is, indeed, apt to fall into the opposite extreme of hard prosaic literalness, to the neglect of the legitimate charms of art. His principal work this year is a well-told version of the story of Dr. Johnson standing an hour bareheaded, exposed to the inclemency of the weather and the sneers of the passers-by, in Uttoxeter Market, by way of penance for having refused to keep his father’s bookstall in the market fifty years previously. The absorbed look of the brave doctor, as true to his purpose and served by the feeling that prompted it, he allows the taunts and jeers of the market boors to go by him, and the touch of sympathy in the look of the country girls, are well conceived. The colour is not so agreeable.